Aesop – a premium skincare range surely targeted at a story-loving lady like myself. I discovered this 28-year-old brand one autumnal morning down a quiet side road in Richmond, enticed to the shop door via a beautiful font, trace of scent and inky exterior. A red haired beauty quietly welcomed me, a chic plait reaching halfway down her back, its auburn glow texturally offset by perfectly cut dark linen. Her accent when she spoke was hard to trace, perfect English with a Scandinavian lilt, conjuring up a perceived heritage of exquisite taste. I felt like I had been invited to an exclusive art event, and I was the only guest. I hushed my tone and stepped on in. It is, in truth, a fairly austere aesthetic. 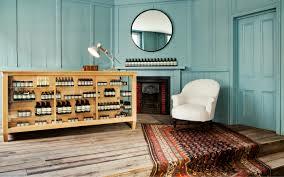 As an interior architectural representation of Aesop, this brand’s brief has been filled. It is fully immersive. The environment exactly echoes the product. You feel as if you have stepped into an Apothecary of days past, rows of amber hued bottles labelled with precise stripes of black and old white, visually juddering against the organic backdrop of roughly hewn timber floor planks. The walls are the perfect shade of heritage. The rug distressed, warm and the right touch of faded grandeur and luxury. The potions within the bottles are natural and delicious sounding, botanical and unisex. Parsley seed, Geranium, Camellia Nut. All aromatic and enticing, grounded by words intended to reassure you of their efficacy. Anti-oxidant Hydrator, Exfoliant Paste, Cleansing Masque. My taste curator (no mere sales person, as it was now apparent), asked me if I was familiar with the Aesop brand, in her intriguing soft voice. I was clearly here for an experience, and my auburn plaited Toast model was here to guide me. I peered closely at the various products. Beautiful badger hair bristle brushes for whipping up silky shaving oils into unfathomable lathers in shiny silver bowls. ‘Reverence Aromatique’ Exfoliating hand washes, ‘Rose’ Hair & Scalp moisturising masques, an elegant botanical treatment oil called ‘Breathless’. Not too much choice, but all deeply desirable. The bewildered look on my face prompted my taste curator to fully take me under her impeccable wing. Perhaps a body cleanser, she enquired gently. Turning on a stunning copper tap, rising fountain-like from a circular ornamental basin placed the middle of the large elegant room, she rolled up my sleeve and with a cool hand expertly dropped nectar like liquid into my cupped palm. She indicated with a smile that I should wash my bubbling fingers under the perfectly warm running water. Taking an immaculate flannel from an artfully placed ladder against the pillar beam, she dried my freshly washed hands as if I were something precious and fragile. For that moment, I loved her. I inhaled the lingering scent on my skin. I wasn’t leaving without it. Following her to the stunning glass topped counter, I watched her bring out a large drawstring muslin bag, beautifully branded. She held it out at arms length and spritzed it with the Aesop signature scent. She carefully placed my Geranium Leaf Body Cleanser brimming with Mandarin and Bergamot Rind in that scented bag, along with eight carefully selected sachets of complimentary oils and creams that she chose from tiny drawers in front of her. My taste curator then came out from behind the counter to present me with my Aesop bag with a graceful warmth. No barriers between us. I was now part of the Aesop clan. I left the shop with a smile that lasted all day. Pushed to the back of my mind was the fact that I had spent an astonishing £31 on some soap, and I was left only with the memory of the most wonderful retail experience. If only all shopping could be as pleasurable. Every morning, my sage souls, as I stand in a cloud of geranium and steam, I re-live a secret sliver of the delight I felt that day. By the mere use of this delicious product, I am exclusive. I am tasteful. I am transported back to that dream interior space and I am living that fabled life. Thank you so much, you are so kind! Soap update – it seems to last for ages! So it’s good value really (I tell myself every morning, whilst using it as sparingly as gold dust).